Just another wedding? I think not! Our groom, Charles, was former minor league player for the Colorado Rocky baseball organization and was excited to incorporate baseball into his wedding day theme. So after doing portraits at Silverado Country Club in Napa we headed with the bridal party to the Kennedy Park for some quick batting practice. 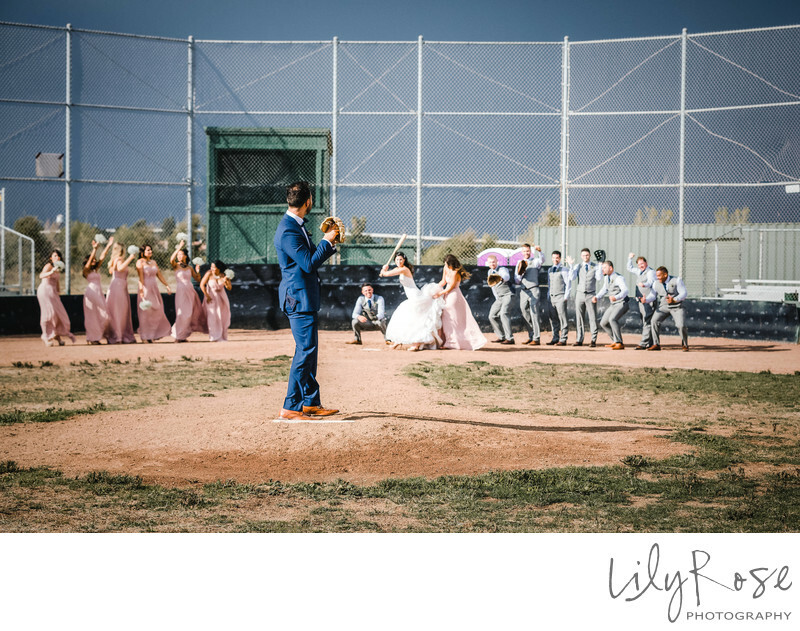 With the teams (bridesmaids vs. groomsmen) lined up on each side of the field our bride, Leia stepped into the batter’s box to face her soon to be husband. As the couple was cheered on by their wedding party the groom pitched his best stuff to his bride. She fought hard, but in the end was no match for him and Leia went down swinging at the altar by marring Charles in the mist of a thunder storm. The wedding was about an hour later at Wedgewood Fairview Napa at Kennedy Park and even the rain delay could not dampen the spirits of our couple. The banquet room was adorned in a theme of baseball and rustic decor. A antique display rack of baseball “tickets” greeted the guess as they enter the reception hall and directed them to their seat location. After our rain delay and with our ceremony complete our couple loosened up with an amazing sunset photography session which included a wonderful rainbow over a scenic golf course picture as well as striking silhouettes in front of a sunset that was filled with brilliant reds, blues and purples. Charles and Leia’s wedding day was a wonderful example of how a couple can personalize their wedding day to make it truly one like no other. Thank you Charles and Leia for allowing us to photograph your Napa Valley wedding at Wedgewood Fairview. Location: 2295 Streblow Drive, Napa, California 94558.